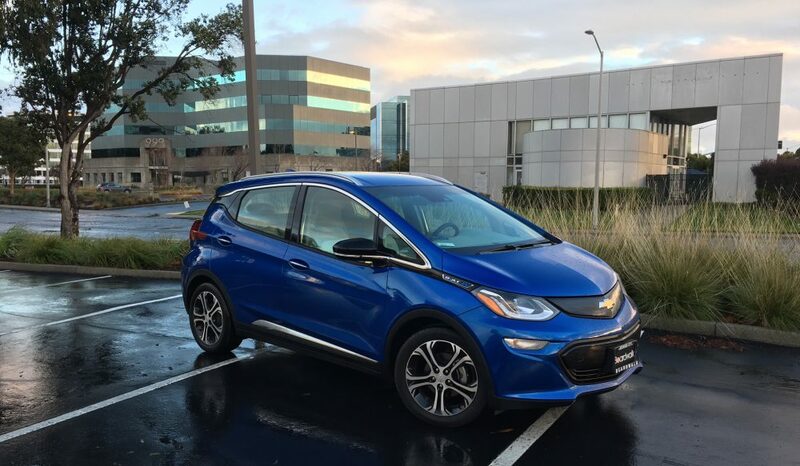 I’m waiting for my Chevrolet Bolt to be built. As of October 24, the order is submitted to the factory and accepted by production control, according to my salesman, Don Mays. So–what kind of factory does GM have in Orion, Michigan? Well, the General Motors Orion Assembly Plant gets more than half its energy from methane from decomposing trash, and has a 350-watt solar array. That’s pretty impressive! One of the arguments is, why not just use your old car–it’s already built? Why spend all the energy to make new ones? If the factory runs efficiently, there’s less cost to driving a new electric car. It’s a complicated story, and we’ll keep following it. Meanwhile, I’ll be waiting for the next installment from Chevy. The Audi A3 e-tron gives the premium German marque an entry point to electric motoring. Based on the previous generation Sportback wagon, it combines a 150-horsepower 1.4-liter gas engine with a 102-horsepower 75 kW electric motor to make a combined 204 horsepower drivetrain. With 258 lb.-ft. of torque, it pulls the compact wagon from 0-60 in 7.6 seconds. Electric vehicles, even half-electric ones, use the MPGe rating, which offers an efficiency standard that you can use to compare competing vehicles. For example, you can measure the A3 against the plug-in Prius or the Chevrolet Volt. The A3 e-tron earns an 86 MPGe rating using electricity and gasoline, and a 39 MPG with gasoline only. I averaged 96.4 MPGe during my test week. The window sticker claims I’ll save $3,750 a year in fuel costs over the average new vehicle. EPA fuel economy ratings are 8 for Smog and a perfect 10 for Greenhouse Gas. The 138 grams per mile of CO2 is lower than most cars, but, of course, higher than an all-electric car. One way to compare plug-in hybrids is by the range they can drive on electricity alone. The A3 claims 17 miles, and in my 18-mile commute, I found that to be accurate. Just before I arrived at my office, the gauge indicated the switchover. So, I plugged in and had enough to get almost home, and so it went. By charging at both ends, I used very little gas for commuting. Charging is simple. Plug in to standard 240-Volt (level 2) chargers at work or in other public places, or use your own household current, which is 120 Volts (level 1). It’s an eight-hour process at home, comfortably overnight. On a level 2 charger, it’s just two and a quarter hours. You won’t be hogging the chargers while others wait. They’ll appreciate that. The A3 is on the lower end of the range listing for plug-ins, but it still makes a big difference. The Chevy Volt offers an honest 53 miles of charge before switching over to its gas engine, which generates electricity to run the electric motor. The Audi is typical of a hybrid, using the gas engine and electric motor interchangeably as needed. The A3 e-tron offers four driving modes, which you select on the dash. EV mode uses the electric motor only. In Hybrid mode the car’s computer picks the most efficient power source for the driving conditions—EV, gasoline, or both. In Hold Battery mode, the car is a hybrid only, saving the battery charge for driving all-electric later. The Charge Battery mode uses the engine to charge the battery while you’re driving at freeway speeds. I ended up taking a six-hour round-trip to an exciting but farther away than I thought microbrewery, so for that trip, the A3 behaved like a normal hybrid car. And that’s what distinguishes a plug-in from an all-electric car. You can pretty much go wherever you want to, but drive hyper efficiently when you stay local. The 8.8 kWh lithium-ion battery pack sits under the rear seat, and because it doesn’t take up any cargo space, the wagon is fully usable to carry your stuff. Other plug-ins like the Prius and Volt are hatchbacks, so the A3 has an advantage with a lower sill for easier placement of, say, a bass, in my case. The A3 Sportback wears a new name: e-tron, which Audi will use to identify other, future electric and hybrid models, too. For now, it looks and feels like an A3, which is a good thing. The premium craftsmanship inside, simply presented at this level, is pleasant and feels substantial and carefully thought out. My Misano Red Pearl Effect test car greeted me with a sweet leather aroma when I opened the door for the first time. The switchgear works nicely, the eyeball vents swivel satisfyingly, and the it’s a pleasant place to be. The A3 e-tron comes in three levels: Premium, Premium Plus, and Prestige. Base price is $37,900. My tester was a Premium Plus, which added $4,100 to the tab. That got me extras like 17-inch, 15-spoke alloy wheels, 3-D optic inlays, the Audi music interface, heated front seats, and aluminum window surrounds. The $2,600 Technology package added a navigation system, Audi Connect online services, and more. They charged $575 for the fancy red paint (a typical Audi upsell). The bottom line came to $46,100. If you’re an Audiphile, this is your high-efficiency choice. An all-electric e-tron model should be here soon.